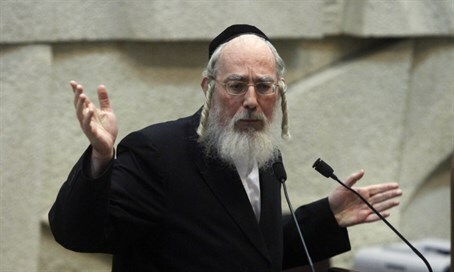 MK Eichler says Torah council to rule on Supreme Court demand for full ministership, but party never had 'ideology' against it. Just a day after the Supreme Court ruled that MK Ya'akov Litzman (United Torah Judaism, UTJ) cannot continue to serve as deputy health minister but must rather become a full minister and pledge loyalty to the state of Israel, a UTJ MK came out on Monday saying the party has no "ideology" against such a move. Unlike the Sephardic-haredi Shas party, UTJ does not consider itself "Zionist" even though practically-speaking it takes part in the Israel political system. As a result, when UTJ enters a coalition government it stipulates that its MKs should be appointed deputy ministers with no minister above them, rendering them "acting ministers" - and freeing them from having to swear allegiance to Israel. But UTJ MK Yisrael Eichler on Monday said his party never had ideological opposition to having its members serve as full ministers. "There was never an ideology not to be a minister," Eichler told Army Radio. He appraised that the UTJ Torah sage council that is to meet on the matter this Wednesday will agree to having Litzman appointed as health minister. "I can't guess, I can only reason what the Torah sage council will decide. The main thing is that the ones to decide it will be the Torah sage council and not me or Litzman," said Eichler. He also praised Litzman for being willing to accept whatever the council decides, without any motivation for his personal career. The Supreme Court decision came following a petition from the Yesh Atid party that has often been at odds with the haredi community. According to the ruling, Litzman will have to either step down from his post or else become a full minister within 60 days.